Elegant, clean wedding program for your event. Completely editable. 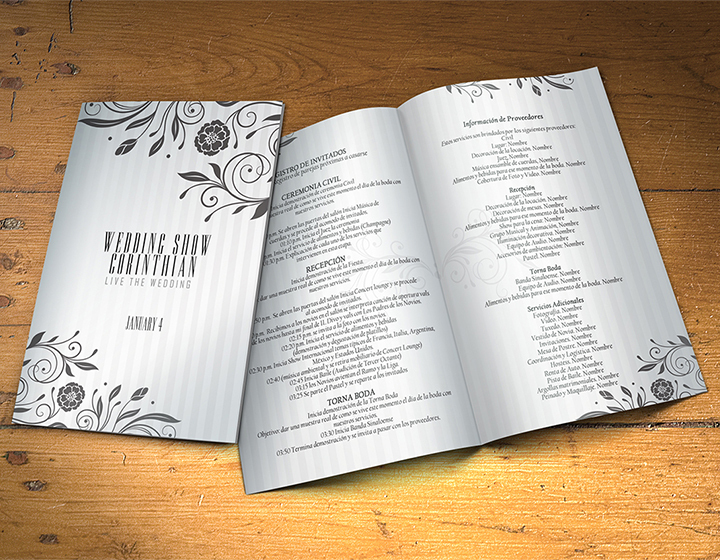 New Wedding program template PSD 2 sides. PSD template with 300 DPI (High Definition). You can choose your own colors and add your own logo. The program includes the cover and the inside templates. Two different sides. Logo wedding is included too. All indluded! Download this program template now or get more templates for your weddings here like flyers for the event or more program designs. 2 PSD Templates. Inside and outside design. High definition – 300 dpi. All you see in the demo of this trifold brochure is included in the design file.